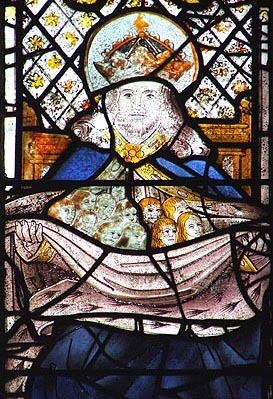 St. Brychan Brycheiniog was the son of King Anlach of Garthmadrun by Marchel, heiress of that kingdom. Perhaps he was a freckled baby as his name implies. Brychan was born in Ireland but, soon afterward, his parents moved Wales, to Y Fenni-Fach, then Marchel's homeland of Garthmadrun. At the age of four, Brychan was sent to be tutored by a holy-man named Drichan beside the River Ysgir. Seven years, Brychan was schooled in the ways of the World, before the poor blind Drichan finally called Brychan to bring him his trusty spear for the last time. With it, he pointed to a nearby boar and a stag who came from the forest to stand with a fish in the river, by a beech-tree dripping with honey; and Drichan predicted a happy and abundant future for the young Brychan. A few years later, war broke out between Anlach and Banadl, the usurping Irish King of Powys. The fight did not go well for Anlach, and he was forced to send Brychan to Powys as a hostage in order to protect his lands. Brychan was treated well at the Irishman's court, but he fell madly in love with his host's daughter, Banhadlwedd. The match was frowned upon and, overcome with lust, Brychan took the poor girl by force. Before Brychan was sent back to Gathmadrun at the end of the War, the Irish Princess bore him a son named Cynog. Brychan gave his child a golden armilla as a sign of his paternal recognition. Back in Garthmadrun, Anlach eventually died and the nobles raised Brychan to the Kingship. From Talgarth, His reign was triumphant, as Drichan had predicted, and the people decided to rename the Kingdom Brycheiniog in his honour. He was a saintly King dedicated to the Christian Church and its teachings. He married three times and had so many saintly children, they are almost impossible to count. The most popular figure is twenty-four sons and twenty-four daughters. Together they are known as one of the "Holy Families of Britain". Depsite his piety, Brychan was not above defending his lands or his family when the need arose. One of his eldest daughters, Gwladys, was once abducted by King Gwynllyw of Gwynllwg. Brychan and his armies pursued them for many days and many nights before a horrendous battle was fought at which many men fell. Luckily, the High-King Arthur intervened and the two Welsh Monarchs were soon reconciled. On another occasion, the King of Dyfed (or Gwynedd) raided Brychan's Kingdom in order to dispel a boast by one of his countrymen, that no spoil could ever be taken from Brychan's land. When the King of Brycheiniog discovered this treachery, he led his armies to a great battle victory, after which the dismembered limbs of the enemy were collected as trophies! In old age he is believed to have abdicated the throne of Brycheniog in order to become a hermit. He was succeeded in Brycheiniog by his eldest son, Rhain Dremudd. Professor Thomas suggests that Brychan's life at this period should be identified with that of his so-called son, St. Nectan. He died at a great age in the mid-5th century and was buried on Ynys Brychan (possibly Lundy Island).